I have wanted to try this type of chevron effect for several years. Stripes are fun to be creative with but sometimes challenging to sew. This wavy lace from Mood Fabrics wasn’t difficult at all, though, because it’s a medium weight and kept its shape when sewn in bias form. 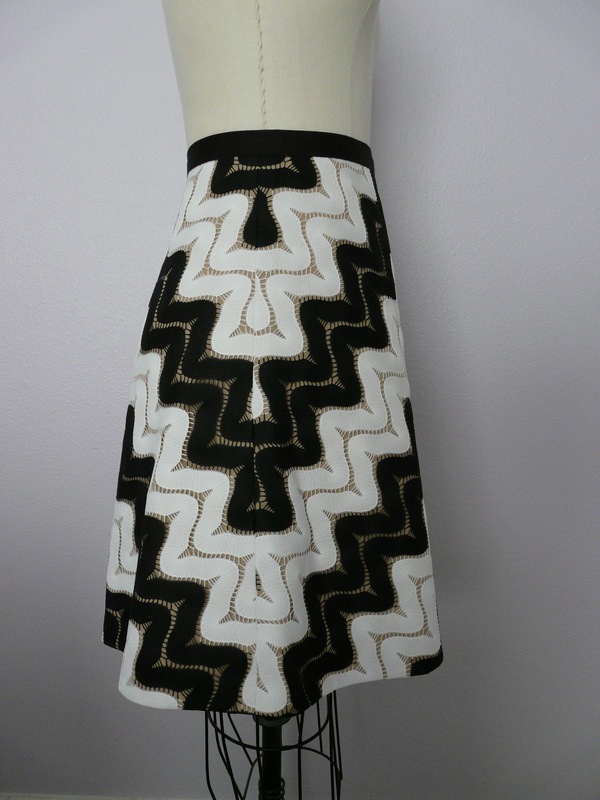 It also had the cutest wavy black edges that I wasn’t able to use for this garment. The pattern I used had straight grain arrows on the paper, so first I had to draw in the bias grainline that I wanted. I did that with a drafting triangle left over from a college blueprint class. Then I determined where I wanted my center front – in the middle of one of the black zigs – and lined up my newly drawn grainline. I didn’t want any tiny bits of black or white to show up in the corners. After the first piece was cut I flipped it over and used it to cut a mirror piece for the other side. I cut my back pieces the same way, being careful to start the center back in the same spot as the center front. The sides match up horizontally but not completely vertically because the side seams are at a slight angle. Obviously, being lace, I had to have some sort of lining or underlining. Fortuitously, I happened to lay the lace over a beige skirt I needed to iron on my ironing board. 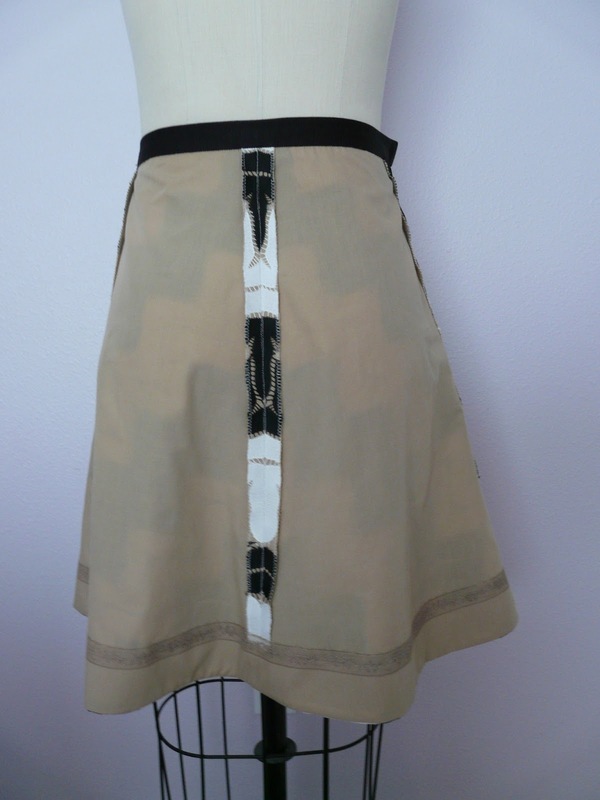 Black, white and beige go together so nicely and it doesn’t distract from the skirt design. I used a thin cotton blend bought locally and cut it out using the original straight grainlines printed on the pattern. All the lace pieces were underlined before being stitched together. I had intended to use an underlined piece of lace for the waistband as well, but none of the lines matched up and I didn’t like the effect. Instead I used a piece of 2″ petersham grosgrain ribbon from my stash. It was stitched along the bottom of the ribbon to the inside of the skirt, then folded over and carefully stitched to the outside along the same row of stitching. 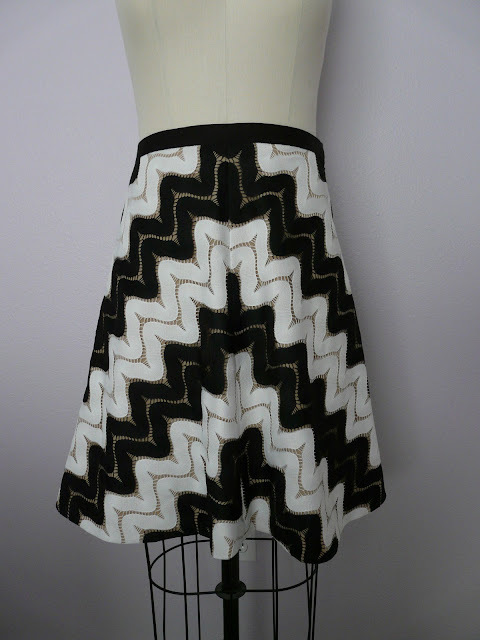 I chose not to line this skirt and finished all the seams with my overlocking foot. 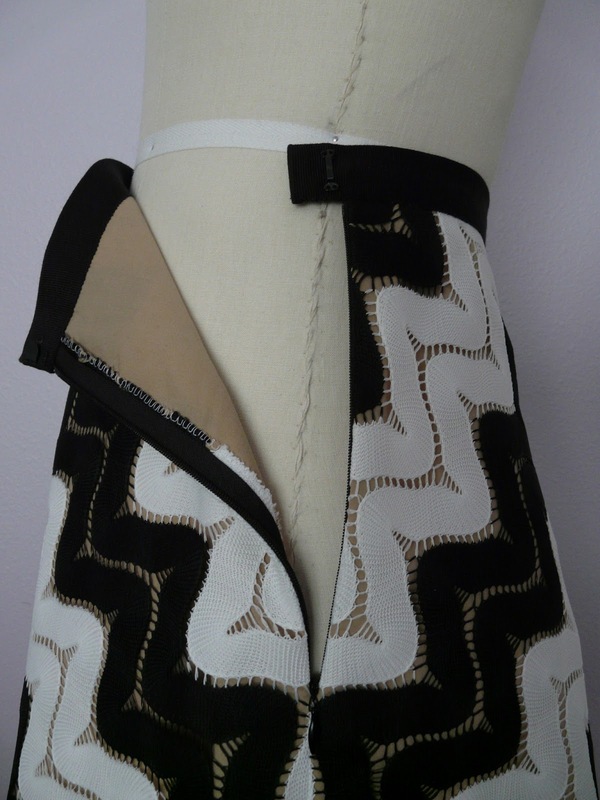 The black tab of my invisible zipper disappears into the black of the lace at the top side seam. For the hem, I cut facings from the beige underlining. Since I needed to attach the hem by hand in order to not catch the outer lace, I used hem lace at the edge of the facing and whipstitched. I find my whipstitching always looks nicer with hem lace. I used Simplicity 2314 for this project. This is a simple pattern with a waistband, which pattern companies strangely don’t seem to include on most skirt patterns. I like my new skirt a lot! 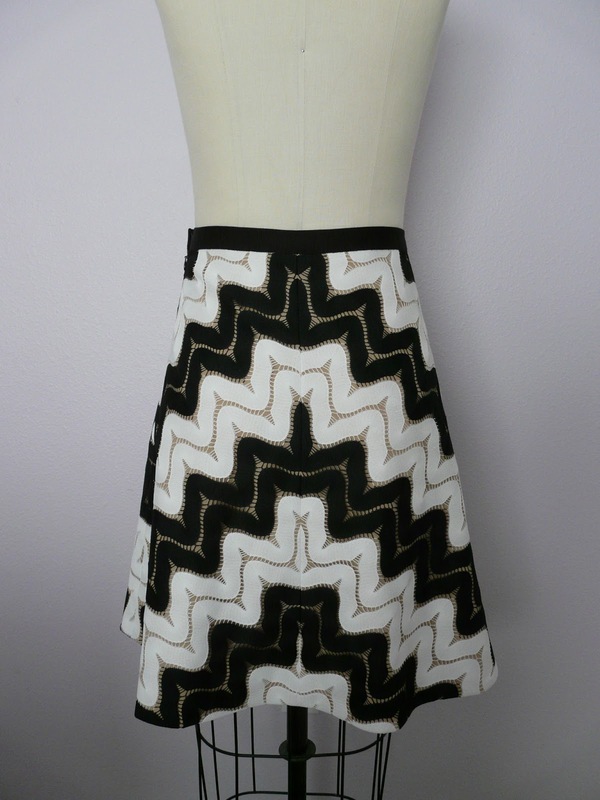 Black and white is very trendy right now, but it’s also a classic color combination. I have a large remnant left over so you might just this fabric again soon!